Once the house was clean and I put my feet up, that was the end. Laziness took over and still has its hold on me. I had so many plans about writing about all the many samples and decants I took with me (like I said, optimist), and I’ve been smelling them and wearing them, but I just have no will to write about them. I don’t even take notes. I just enjoy the sun and the books and sniff my wrists to make the summer enjoyment more profound. And that’s it. I still have several days of this left (not that many, I’m back to work on Monday) but while I’m here, I’ll enjoy those last few days of not doing anything to the fullest. One thing I love about spending vacations at the seaside is the fact that nothing smells as carefree and relaxing as a summer sea breeze. It is better in June though while the greenery is still alive, now it’s a bit fried and dry by all the sun beating upon it. But it’s still wonderful. And then one day my first week here we had a real summer shower. You know the one that smells of wet dust, herbs and has a slightly metallic tang to it. Everything just smells better when sea is its background. My batteries are full and I’m ready (as much as I can be, I’m always sad when my summer vacations end) to get back to my usual routine and that also means writing. I can’t wait actually. And one thing I realized here when spending time surrounded by many people who visited us here is that I have a serious problem talking coherently. I just got used so much to writing my thoughts that now it seems I need to concentrate better when I want to sound as a person capable of coherent talk. 🙂 Oh well, sea and sun will do that to you. I’ll post some pictures when I get back (I have some really nice ones) and until then, just this one which I took yesterday of a beach on the island of Krk which is right across from where we are and this beach can only be reached by boat. 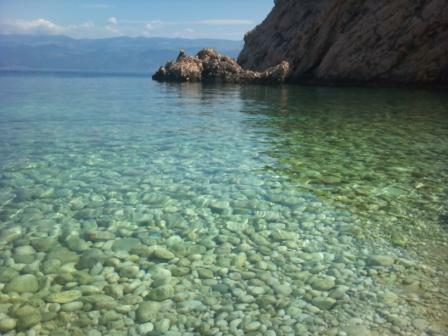 Krk looks beautiful – what an amazing colour the water is!Don't feel guilty about not paying more attention to your perfumes lately – hey, you were on holiday, after all! I guess we could all use a break even from our favourite hobbies. I love reading about vacations every bit as much as I love reading about perfumes. Yours sounds glorious and relaxing, Ines. Enjoy your last few days! Oh, wonderful! You took a real vacation. That is, I think, a Very Important Thing. I cheated this year, and posted from my big adventure. Which is why I think I took time off whilst I completed my other adventure this past week. I am all about creative bursts and time outs. :)Thanks for the photo…vicarious traveling can be a calming, happy thing for me, and that is a beautiful place. Will enjoy seeing more when/if you put them up.Welcome back.